A very interesting four part article written in the Philadelphia Inquirer. It took three years for Eileen and Chris Romich to painstakingly research where their intellectually disabled son, Jonathan, 28, should live when they moved him out of their family home. It took just three weeks for that plan to implode, leaving the family with ongoing fears for their son’s safety. Flash back to 2014, when Eileen, 58, and Chris, 59, realized that Jonathan was ready to start establishing a life away from his family . Jonathan Romich breaks into a big smile as he listens to music. 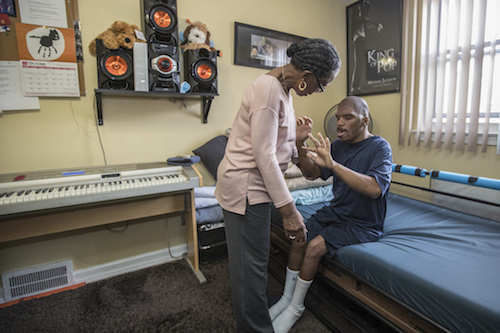 The Romiches finally decided to rent a one-bedroom home for Jonathan, eight miles away, where agency-provided staff would monitor him around the clock, transport him to his daily activities, and manage his complex medical needs. He was born with Delleman syndrome, a rare genetic condition that causes brain malformation. As a result, he is blind, and has muscle weakness, seizures, and intestinal abnormalities that have required multiple hospitalizations. He barely speaks, but he’s aware of his surroundings, knows and loves his family (the Romiches also have daughter Julia, 23, and son Scott, 22) and likes to play cassette tapes of music he has collected over the years. He has a musician’s ear: After hearing a commercial jingle just once, he can tap it out on an electronic keyboard. And he enjoys the sounds of timepieces; every half-hour, soft chimes from multiple wall clocks echo around the family room.